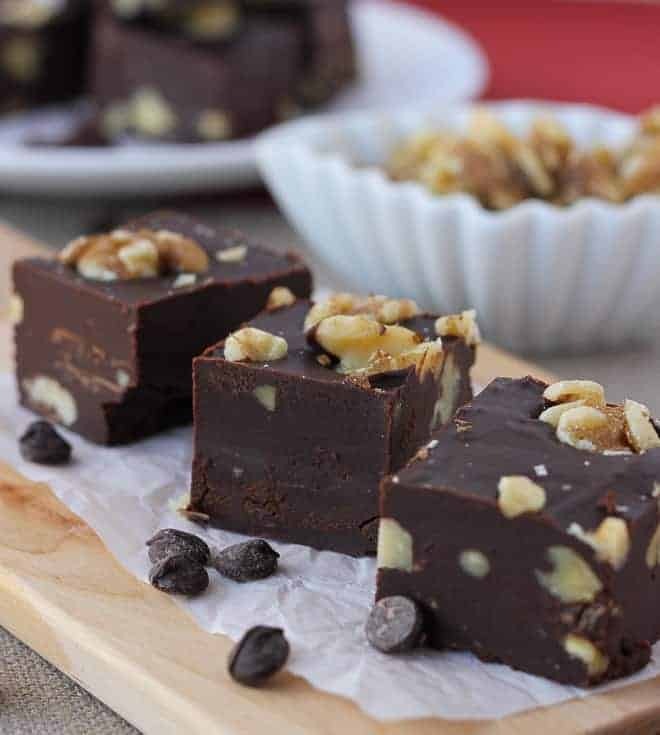 Easy, Dairy-Free Fudge! Refined-Sugar-Free and foolproof! I love making fudge this time of year! In years past, my family has always made the famous “fantasy fudge” using a jar of marshmallow creme. I love that fudge, but now that I am eating dairy-free and avoiding refined-sugar as much as possible, I needed a new fudge recipe. Just as a side-note, eating dairy-free, in addition to gluten-free, has been totally worth it for me! I had some unresolved sinus problems that have completely cleared up. I have also always struggled with my skin breaking out on and off my whole life. I used all sorts of harsh creams and medicines to combat it. Within 2 weeks of eating dairy-free, my skin completely cleared up and I haven’t had a breakout since! Who knew that all along the answer was the right food? It’s amazing the power of the right food and the determent of the wrong food. It is so worth it to me to eat right so I can be healthy and live life to the fullest! 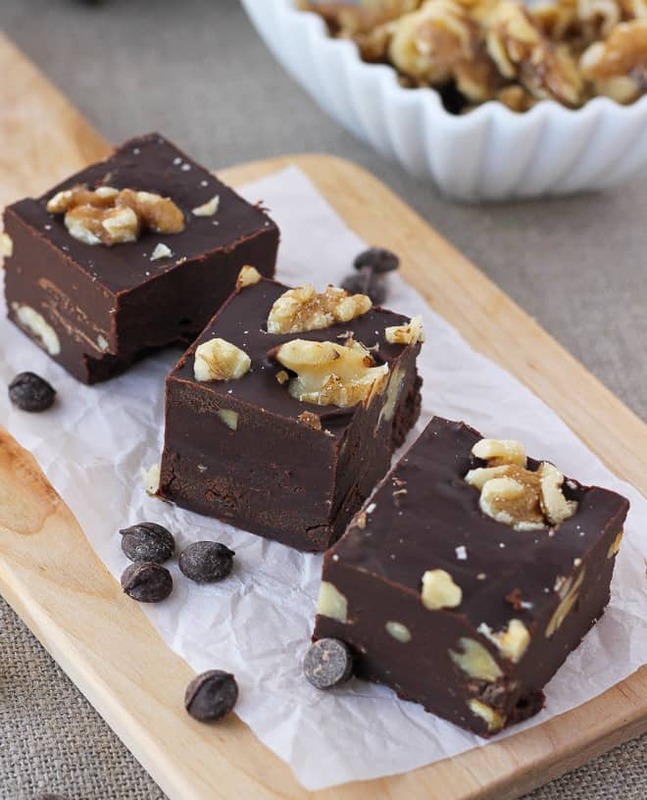 This dairy-free fudge couldn’t be easier! I was inspired by another popular fudge recipe that uses only sweetened condensed milk and chocolate chips. For this fudge you basically make your own sweetened condensed milk using coconut milk and honey. That might sound hard, but all you do is simmer the two together for 30 minutes or so. Then add dairy-free chocolate chips, vanilla, and any other mix-ins you like! I love adding walnuts or hazelnuts. This would also be yummy topped with crushed peppermint candies. I remember I sometimes had problems with other fudge recipes becoming crystallized or grainy. This fudge is basically fool-proof and turns out smooth and creamy every time. My husband said it’s the best fudge I’ve ever made! Line a 8×8 pan with parchment paper. Set aside. Pour the coconut milk into a medium saucepan. Heat the milk over medium-high heat until boiling. Reduce to a simmer and cook for 5-7 minutes, stirring occasionally. Whisk in the honey and simmer for another 25-30 minutes. You want to reduce the mixture to 2 cups of liquid. After about 20 minutes check to see how much it has reduced by pouring the mixture into a glass measuring cup. When you have reduced the mixture to 2 cups of liquid, remove it from the heat. Stir in the salt, vanilla, and chocolate chips until the chocolate is melted. Stir in the nuts. Pour the mixture into the prepared pan. Refrigerate for 2 hours until set. Cut into squares and enjoy! Store the fudge in the refrigerator between serving. *For coconut milk, I use the brand Natural Value from Amazon. It is packed in a BPA-free can and only contains coconut extract and water. *I buy dairy-free chocolate chips in a big bag from Costco. The brand Enjoy Life is also dairy-free. Wow- dairy free fudge? I didn’t think it could be possible! I love this idea, and especially how you’ve made your own sweetened condensed milk. I tried making fudge for the first time last year and I got that grainy thing you’re talking about. I’ve got to try this recipe! Pinning… thank you so much! WOW!!! This past weekend my family got together to bake Christmas cookies. I might have been jealous and feeling a bit of self pity but NO! I made this fudge! It is amazing, tastes exactly like the fudge we used to make that was full of really yucky things. Thank you so much! I am so happy to hear that! I’m glad you liked it! What size are the coconut milk cans (amount of liquid), and can you use the coconut milk from a carton? Unfortunately coconut milk from the carton will work for this. I use 2 13.5 ounce cans of full-fat coconut milk which is about 4 cups. did you mean the carton will not work? Yes the carton does not work for this unfortunately! 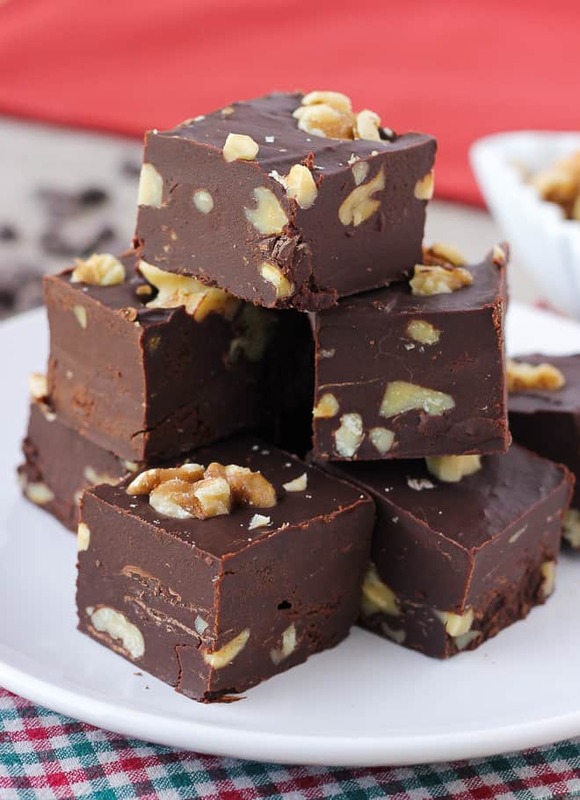 I am making this fudge right now and am having trouble reducing it to 2 cups. I have been simmering it for about 30 minutes and it is only a little less than 4 cups. I am doing something wrong? What kind of coconut milk did you use? This fudge is EXCELLENT! And I feel so much better about eating it! Could I use stevia instead of honey or is it necessary for texture and thickness? Hi Kate! Unfortunately hemp milk won’t work in this recipe. Coconut milk has a higher fat content and is what gives the fudge it’s structure. This recipe is simply delicious! this is the best fudge I have ever made, the coconut milk and honey is so perfect for making fudge, I will no longer make fudge any way but this! I’m glad you like the fudge!! Can you use dark chocolate? Yes dark chocolate will work great! I was so excited for this fudge and am so sad with the result. It’s a gummy, sticky mess. It feels like gelled pudding. I’m going to leave it a couple more hours in hopes that it’ll firm up and turn out to be as delicious as I expected. I followed the directions exactly and used full fat organic canned coconut milk. :/ Any idea what could have gone wrong? Hi Katie! I’m sorry this fudge didn’t work for you. I’ve made it many times and never had a problem, so I’m sorry it’s gummy for you! What brand of coconut milk did you use? I’m wondering if you used a brand with more additives that is making it gummy. I’ve had good luck with the brands Natural Value and Native Forest. I had the same problem! I put it in the freezer for a few hours and then hopefully I can cut it up that way….I guess I’ll have to be a frozen treat…. I had the same problem, Katie! And like Brandi, I put it in the freezer — even overnight! It never fully solidified, unfortunately. We did get a couple of tasty spoonfuls before I threw the whole thing in the trash. Hiya, I know this post is from a while back, i made this fudge before Xmas. It’s brilliant! Not being able to eat dairy or wheat it was a fab sweet fix and I can eat as much as I like! Just wondering, how long does this last for once set? Iv still got some in the fridge in a jar and have been eating it. But I’d like to know how long it lasts roughly.? Thanks for this post! Great taste great instructions. So easy to follow. I used full fat unsweetened coconut milk and raw honey. Bringing milk to a boil then simmered for 7 minutes, wisked in the honey and simmered. I had to simmer for an hour for it to reduce to 2 cups. It turned out thick and smooth. The fudge is now in the refrigerator cooling to set. From the remnants in the pan it should be delicious! Perhaps you simmered your mixture at a higher heat? I started out on the stove’s simmer setting, at 30 minutes I turned it up to boil a bit harder and it still took another 30 minutes. I am excited to know I can make my own condensed milk! Wonderful! I hope the final product was just as delicious! Thank you for this recipe it sounds perfect. I do have one question to see if you have ever made this fudge with Trader Joes coconut milk? Thank you for your answer and have a wonderful holiday. I’m pretty sure Trader Joe’s sells Native Forest Coconut Milk in the green cans now. Yes that will work! Just as long as it isn’t boxed or refrigerated coconut milk. Hello, I also used the Thai brand and after 3 hours in the fridge I have that caramel consistency that you talked about. I’m gonna leave it overnight and see if is set in the morning. I used the Thai brand, and it took all night to set, but it turned out A-MAZ-ING! This looks great! Can this be made before and stored or frozen? Hi. I’ve just made this and substituted rice malt syrup for the honey as we can’t eat honey. So far it’s seemed to have done alright. This is also easily adapted to the thermomix! Thanks for a great recipe! I am looking at the gluten and dairy free chocolate fudge. It calls for coconut milk. Can you substitute this for Almond milk? This is this only milk my daughter is not allergic to. Unfortunately almond milk won’t work in this recipe. Wish I had another recipe I could send your way! Why won’t almond milk work? Curious, because my husband is allergic to coconut. It has lots of thickening agents and not as high of a fat content. It won’t reduce down like coconut milk does. Even my Hubby who doesn’t care for coconut LOVED this!!! Thank you for all these wonderful recipes! 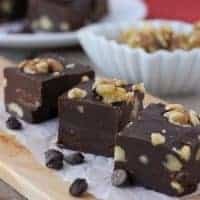 Do you have other fudge recipes besides the chocolate one? I found sweetened condensed coconut milk in the store. Can I just use 2 cups of this in the recipe? Just made this delicious fudge with reduced fat coconut milk I used maple syrup instead of honey ( vegan option) then I added a teaspoon of custard powder once it had reduced , chopped nuts and cocoa powder instead of chocolate. I’ve left it about half an hour and it’s already setting I’m so pleased .. I hope it works out well as it’s homemade Christmas presents !!! How much cocoa powder did you use.. did you add any extra maple syrup to account for the cocoa powder substitution? I was thinking of trying it. I’d love to know if your second go-around turned out. I’m going to make this on Saturday! I made this fudge last night. Haven’t tasted it yet, but the batter tasted pretty good when I was licking the spoon after I put it in the pan. It appears to have set up just fine overnight. I was concerned that after about 2 hours there was still movement in the center of the pan. I used Whole Foods 365 brand coconut milk. On a slow boil (to keep it from glopping all over the stove) it took a good hour and half for it to reduce to 2 cups. By the time the mixture got down to 2 cups it had a real nice caramel look to it. Also I used a Visions (pyrex) saucepan which I had measured 2 cups of water in and then marked the outside of the pan with a Sharpie so I could see when the mixture got down to 2 cups without trying to pour it up in a measuring cup like the recipe said to do. I was also concerned that the mixture would not retain enough heat to thoroughly melt the chocolate chips (also Whole Foods 365 brand), so I measured out my chips and put them in a bowl and set that on the back of the stove so the chips would not be cold when I mixed them in (as a matter of fact the were just about at the melting state when I stirred them in). Can you possibly use just cacoa? Ive no choc chips! Looks delicious.Thank you! I don’t even know how I stopped up here, however I thought this submit was once great. I don’t understand who you might be but certainly you’re going to a famous blogger in case you aren’t already. Seriously such an awesome recipe! 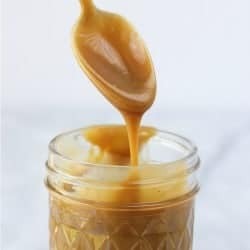 I think making your own sweetened condensed milk is so much easier that I expected. Perfect recipe, everyone should try! What a beautiful recipe. My fudge turned out perfect! So thrilled. Do you think using coconut butter with some water and honey would work instead of reducing coconuts milk? These were delish! Sooo good and creamy. I subbed the honey for maple syrup and added 2T extra and used Lily’s chocolate chips sweeter with stevia. Took the full 25 minutes of simmering. So happy to have fudge that isn’t going to kill my diet this christmas. Thank you! Can’t wait to try more of your recipes. This one hooked me!